Once you have viewed these photos, you may care to read my Maldives Dive Report. Why trek half way around the world to dive the Maldives? Peek through this underwater window along with model Ann Ricciardi, and you will begin to see why. I didn't call him "magnificent," that's in his name! See eye to eye with this little beauty. Meyer is a lucky guy to have his or her name attached to this exquisite fish. He may not be endemic to the region, but I had never seen this particular eel before the Maldives. It is said that the Red Sea received its appelation due to the schools of thousands of these fishes swarming near the surface. Captivated, I am on a mission to photograph full frame images of these jewels of the sea. Here you will see the object of my quest. Who are you calling a Predator? This awesome blackfin tuna circled me from a distance of just a few feet. He smiled - the camera fired - I smiled. This tiny critter is less than an inch long, and quite shy. Often found in groups of 4 or 5, they rarely stop moving when under a divers scrutiny. The reefs in the Maldives are covered in a cornicopia of living color. Here a coral grouper enters from stage right, as sponges, fishes, encrusting corals, and various invertebrates fight for their place in the sun. This is where you can relax between dives. Every afternoon they served us coffee, tea, and cookies up here. In the evenings it was the place for beer and sincere dive lies. During the day parrotfish are constantly in action, charged with the task of turning coral into sand. They are wary of divers and difficult to photograph. At night, though, they find a place to tuck themselves into the reef, and seem to sleep. Easily approached on a night dive, they are sometimes observed to blow a bubble of mucous around themselves to conceal their scent from night-hunting predators. A flying buttress of hard coral juts out off the wall into the current. Colorful soft corals have affixed themselves there so as to filter the current for microscopic life and sustenance. Often encountered in large active schools, these Collared Butterfly Fish (C. collare) are endemic to the reefs of the Indian Ocean. At birth, like most other fishes a flounder has eyes on either side of its head. As it matures, one eye "migrates" to join the other, and the fish becomes a bottom dweller. Born on the sea, the Maldivians are excellent boat builders and fishermen. The design of their water craft is reminiscent of their Phoenician heritage. The Scorpionfish is the master of the art of camouflage. It takes a practiced eye to find one. They are painful to touch, but beautiful to behold. So you'd better start practicing. Butterflyfishes are most always found in pairs. They are exceedingly wary of intruders. When threatened, the pair will split up and swim off at a tangent to one another. When the pressure is off, they soon regroup and renew their promenading. Trumpetfish are clever hunters. I have seen one swim in tandem with a parrotfish (which eats coral and algae...not other fishes). The trumpetfish will mold its body and match its colors to that of the parrotfish, using it as a blind to more easily approach its intended prey. The new 100' M/V Madivaru 7 is the best live aboard dive boat currently operating in the Maldives. Here are some cutaway drawings to give you a better idea what the vessel is like. The world of invertebrate life on the reef is even more diverse than the fishes. Don't consider them insignificant just because they move more slowly. 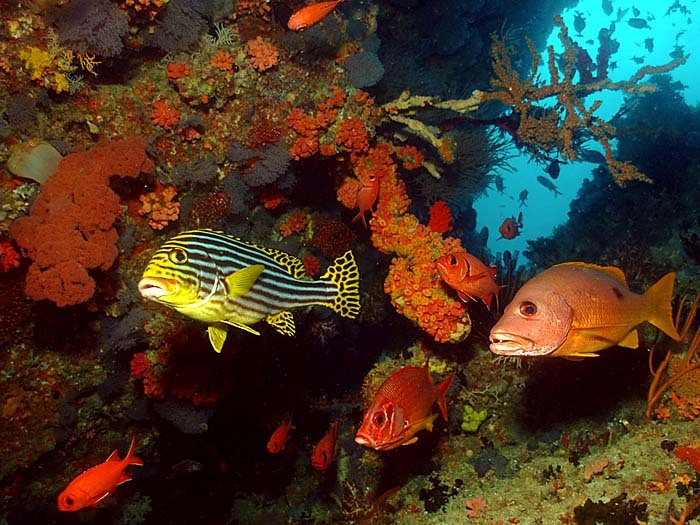 This photo shows a broad range of colorful sponges, corals, and more. This particular butterfly fish is endemic to the Indian Ocean. Forget sharks and baracuda... When its nest is incubating eggs, the Titan Triggerfish becomes the fish to be feared. Rushing at you teeth first, it will chase divers, and other fishes of any size away from its precious eggs. During our surface interval, we took the small dinghy and ran off to photograph this beautiful, unihabited island. Captured in the warm afternoon light, this lovely scene is quite typical of the Maldives.